Harmer she is “F***ing ugly” on Twitter. Joe Waddington, managing partner of Chamberlain Executive, used the social networking site on Friday to tell the writer, radio show host and comedienne that “there’s a thing called plastic surgery”. 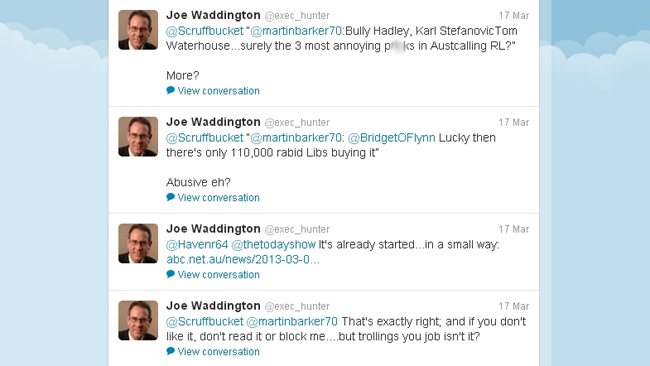 “@wendy_harmer F***cking ugly too” he tweeted on March 22. “I don’t accept that argument, there’s a thing called plastic surgery,” he then replied to another tweet. 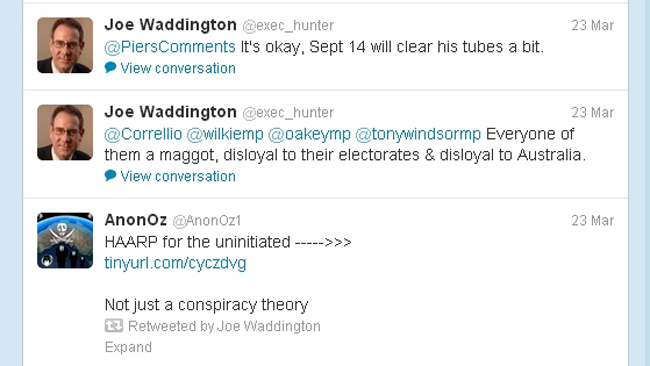 Waddington, whose Twitter account links to his company website, later deleted the tweets. The Brisbane-based recruitment manager said he tweeted the comments while having a few drinks after a barbecue with mates and must have had “a rush of blood to the head”.”It was a disgusting thing to say. It was just awful. Now I’m deeply ashamed about that,” he said. “To be perfectly honest with you, I was a bit drunk. “I really think I should (apologise). I’ve just been too embarrassed quite frankly. Harmer said she had been “astonished more than anything”. 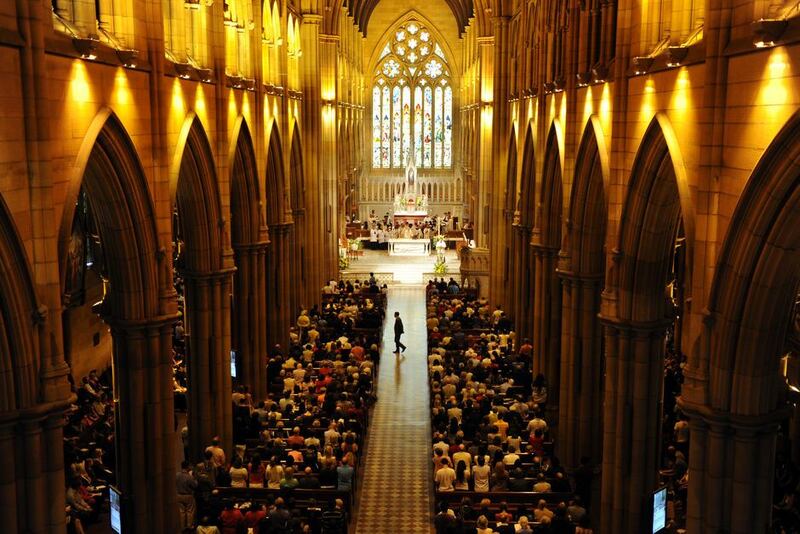 “It’s remarkable. How can you expect to be well regarded professionally and carry on like that?” she said. “Most of the trolls that are on Twitter don’t identify themselves and you find out they are 15-year-old boys, not company executives. Harmer said she and others had sent complaints to Waddington’s website but were yet to receive a response. However Waddington, who works in the financial services sector, said he and his partner ran the company – and the website – themselves. “Joe is personally involved in ensuring the successful delivery of executive recruitment assignments and strategic consulting for a variety of clients, whilst also offering an ongoing career management service to individuals,” the site says. 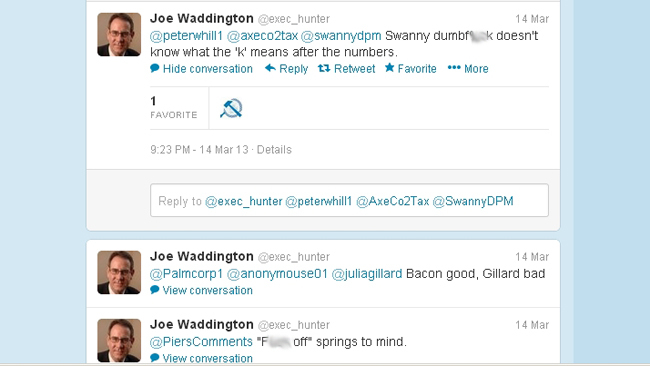 Waddington, who uses social media to insult public figures, told news.com.au that his behaviour bordered on trolling. “Yeah it probably does (border on trolling) quite frankly,” he said. 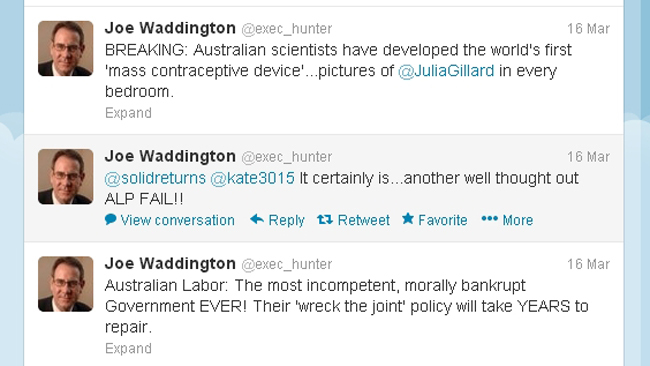 Mr Waddington said that while he regretted his tweets about Harmer, he is unapologetic about calling Prime Minister Julia Gillard “fat guts” and a “lying heifer” with a “big fat yapper”. 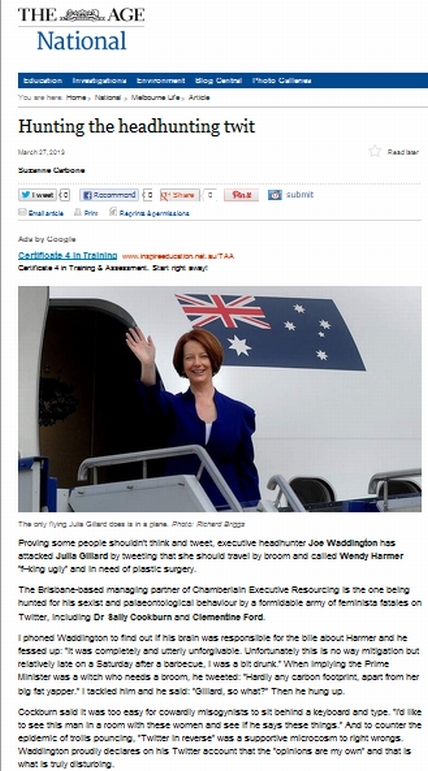 “Don’t forget I’m not the only one (who tweets about Gillard),” he told news.com.au. He has also labelled Labor Minister Greg Combet a “buffoon”, said Kevin Rudd had the “gonads of a pre-pubescent” and uses expletives to describe Treasurer Wayne Swan. He recently tweeted that Senator Stephen Conroy should be “sent straight to a psychiatric ward and sectioned”. “I absolutely am anti-Labor,” he said. “Everybody’s entitled to their opinion I believe. I’m not going to hide behind a nom de plume. The HR specialist said he was not worried about how his public comments reflected on his business. 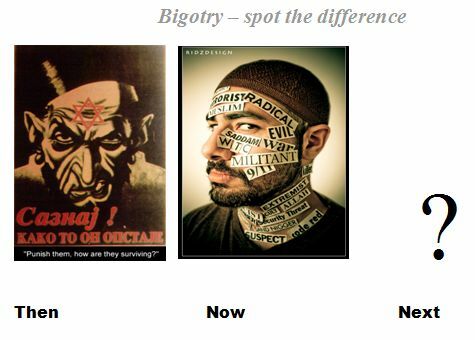 “If organisations take offense (sic) to what I write and my politics that’s their right and there are thousands of other recruitment companies they can use,” he said. “Some executives are in positions and running organisations that will impact on a political basis so then of course they have to be very diplomatic and that’s understandable. He also rejected that he would look unfavourably at job candidates who Tweeted expletives, insults or abuse. “I don’t look at candidate’s tweets and that sort of thing,” he said. 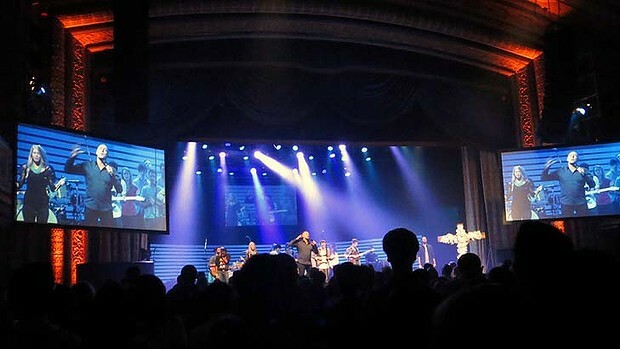 “A candidate will stand on their employment record and that’s the criteria I look at. Mr Waddington tweeted an apology. 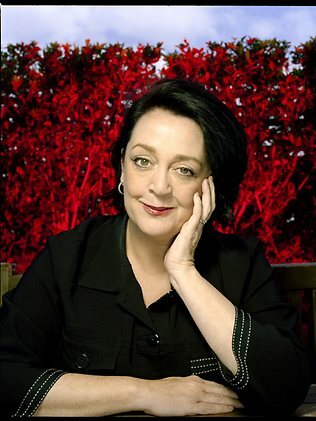 “@wendy_harmer Dear Ms Harmer, I would like to offer my unreserved apology for the unforgivable comments I made on Saturday,” said the first tweet. 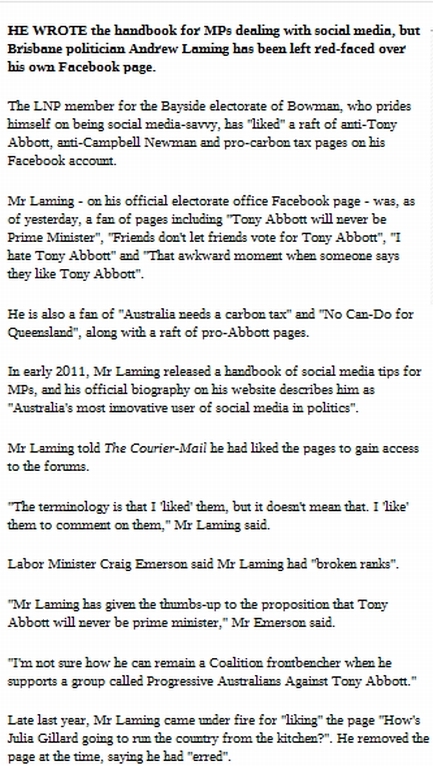 Andrew Laming MP finds Facebook – what can we say? 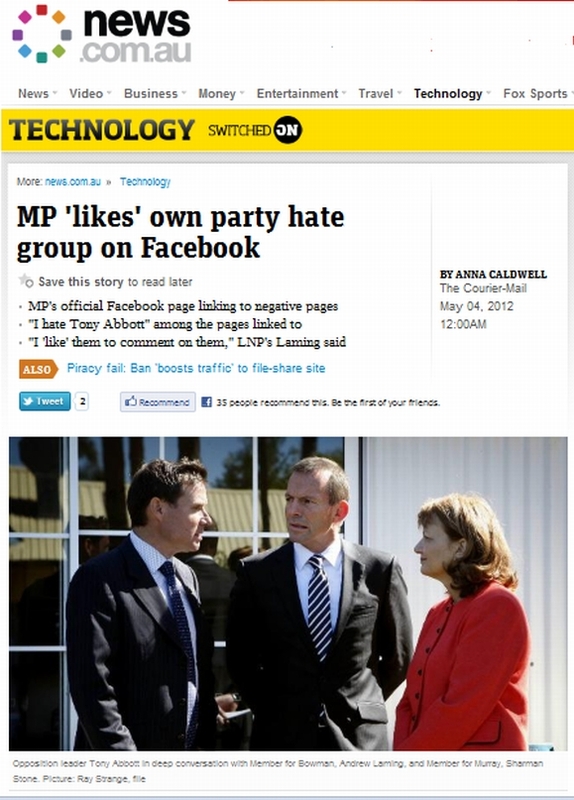 Politicians have recently taken enthusiastically to social media. It seems every politician from the PM down has a Facebook page and Twitter account. However sometimes things can go a little wrong. 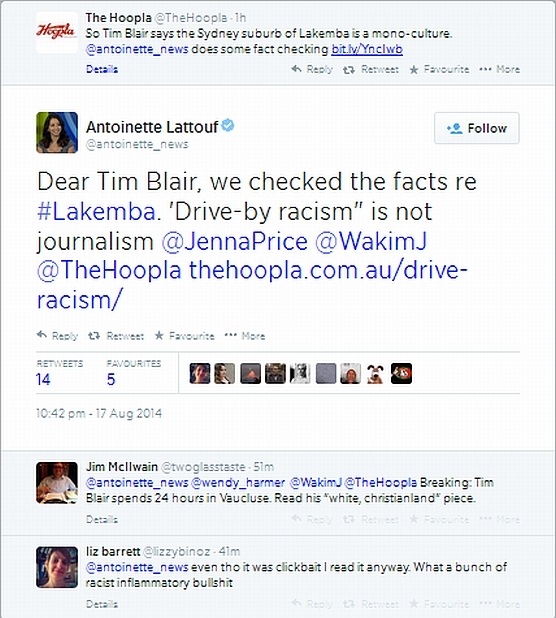 Take Andrew Laming, MP for the Queensland Federal seat of Bowman for instance. Too frequently, women aspiring to public office suffer from PMS: Patriarchy. Misogyny. Sexism. 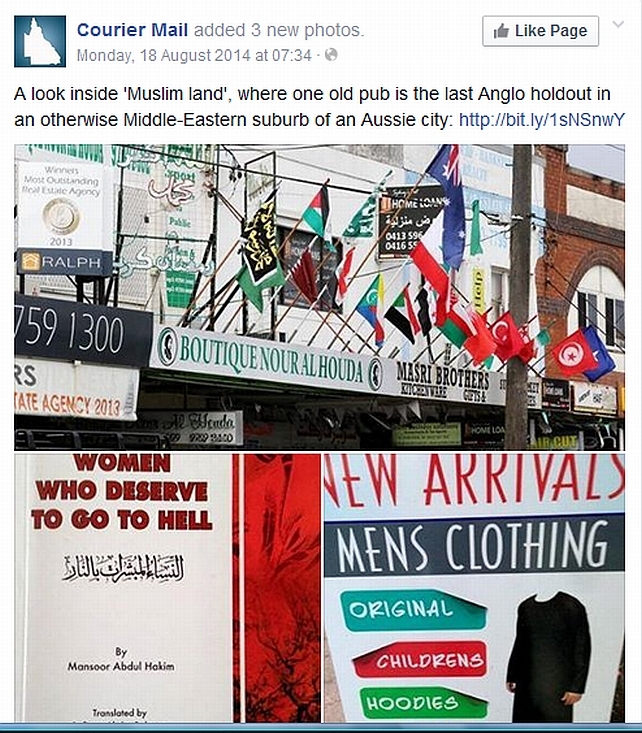 It is all too common to find immature knuckle-dragging misogynist creeps strutting their stuff on Facebook and Twitter, pushing their unwanted fear and hatred of women. We shouldn’t have to be dealing with them in the 21st Century but so far evolution has failed to keep up with the modern world. It is more unusual to find them harassing journalists and commentators from the offices of Parliamentarians, particularly when these staffers are old enough to know better. Note the hectoring tone we so often hear from 14 year old dateless wankers on Facebook. You’d think someone who had actually been the editor of a newspaper would know better. Then Tomlinson goes on to boast how he has managed to keep his own “little woman” in the kitchen having babies for many years. 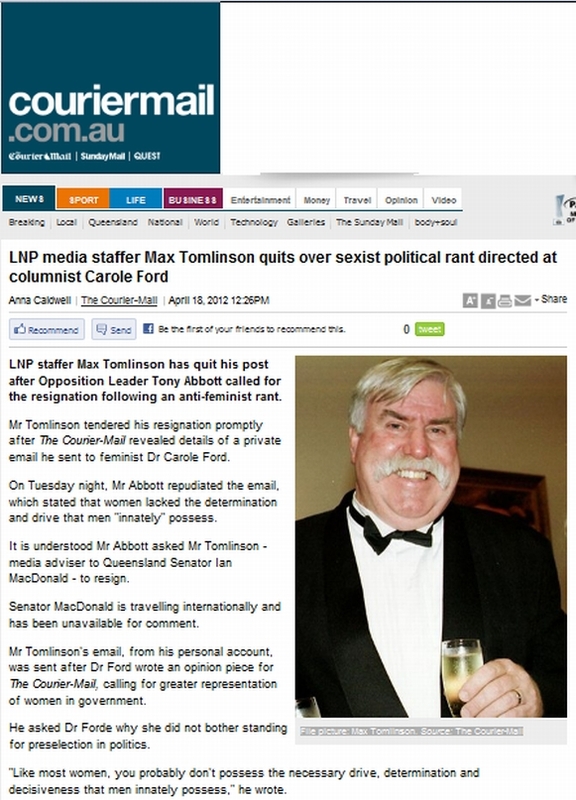 And here is the Courier-Mail article which so upset Tomlinson’s delicate sensibilities. Dr Ford said she had been married for 43 years and had three children and in her first lecture she talked about the work women did “both paid and unpaid” and was a supporter of stay-at-home mothers. So not exactly the stereotypical feminist of Tomlinson’s wild imaginings. 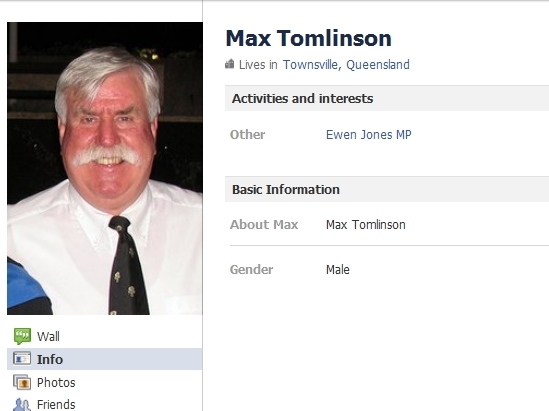 Tomlinson has a Facebook page. Let him know what you think.